This is from the January 9-15 issue of TV Guide. EXCLUSIVE! 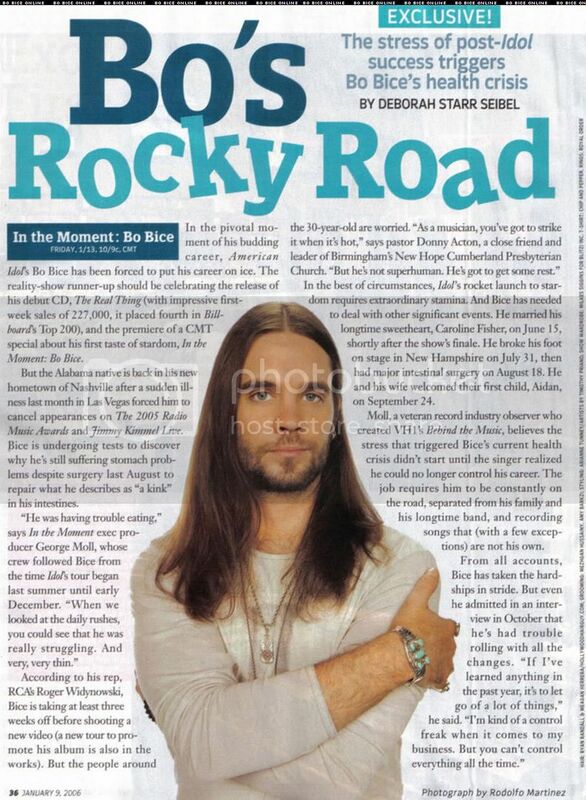 The stress of post-idol success triggers Bo Bice's health crisis. In the pivotal moment of his budding career, American Idol's Bo Bice has been forced to put his career on ice. The reality-show runner-up should be celebrating the release of his debut CD, The Real Thing (with impressive first-week sales of 227,000, it placed fourth in Billboard's Top 200), and the premiere of a CMT special about his first taste of stardom, In the Moment: Bo Bice.But the Alabama native is back in his new hometown of Nashville after a sudden illness last month in Las Vegas forced him cancel appearances on The 2005 Radio Music Awards and Jimmy Kimmel Live. Bice is undergoing tests to discover why he's still suffering stomach problems despite surgery last August to repair what he describes as "a kink" in his intestines. "He was having trouble eating," says In the Moment exec producer George Moll, whose crew followed Bice from the time Idol's tour began last summer until early December. "When we looked at the daily rushes, you could see that he was really struggling. And very, very thin." According to his rep, RCA's Roger Widynowski, Bice is taking at least three weeks off before shooting a new video (a new tour to promote his album is also in the works). But the people around the 30-year-old are worried. "As a musician, you've got to strike it when it's hot," says pastor Donny Acton, a close friend and leader of Birmingham's New Hope Cumberland Presbyterian Church. "But he's not superhuman. He's got to get some rest." In the best of circumstances, Idol's rocket launch to stardom requires extraordinary stamina. And Bice has needed to deal with other significant events. He married his longtime sweetheart, Caroline Fisher, on June 15, shortly after the show's finale. He broke his foot on stage in New Hampshire on July 31, then had major intestinal surgery on August 18. He and his wife welcomed their first child, Aidan, on September 24. Moll, a veteran record industry observer who created VH1's Behind the Music, believes the stress that triggered Bice's current health crisis didn't start until the singer realized he could no longer control his career. The job requires him to be constantly on the road, separated from his family and his longtime band, and recording songs that (with a few exceptions) are not his own. From all accounts, Bice has taken the hardships in stride. But even he admitted in an interview in October that he's had trouble rolling with all the changes. "If I've learned anything in the past year, it's to let go of a lot of things," he said. "I'm kind of a control freak when it comes to my business. But you can't control everything all the time." This is very true, Bo, you cannot control everything all the time, and learning to let go is a great lesson for all of us to learn. Success brings sacrifice and change, but success is something you are meant to achieve. The best advice I could provide is to let it happen; focus on what you love doing and let the rest go. You are not Superman, in the sense of being of supernatural power or strength, but in the sense of having something incredible to share that is unique, powerful and needed in the music world now.